Villa in Xàtiva, 4 dor. + pool + terrace. Located in the heart of the Bixquert Valley, in the city of Xàtiva, with amazing views, facing north, where is its ancient castle. A city rich in history, offering all kinds of services and is perfectly connected by train and road with the rest of the Spanish geography. It has the added advantage of being barely 45 km from the main cities of the coast of the Valencia Community. The international airports of Valencia and Alicante are only 78 and 120 km away, respectively. The access to the plot is by an asphalted road that is used only by the residents of the area. The plot has a size of 1588 sqm and forms an almost perfect rectangle, with a slight slope from South to North. It has completely unobstructed views towards the valley, as you can see in the photographs. From here, to the city there is 4 km, or what is the same, 5 minutes by car. The house, distributed all on one ground floor, has 4 bedrooms, living room, kitchen with independent door to the outside, and bathroom. The roof of the building serves as a covered terrace, from which you can see the best views of the surroundings. Mains water & electric. A villa, well located, spacious (96 sqm) that once renovated, can become a great 2nd residence, or in the perfect place to fix your usual residence. 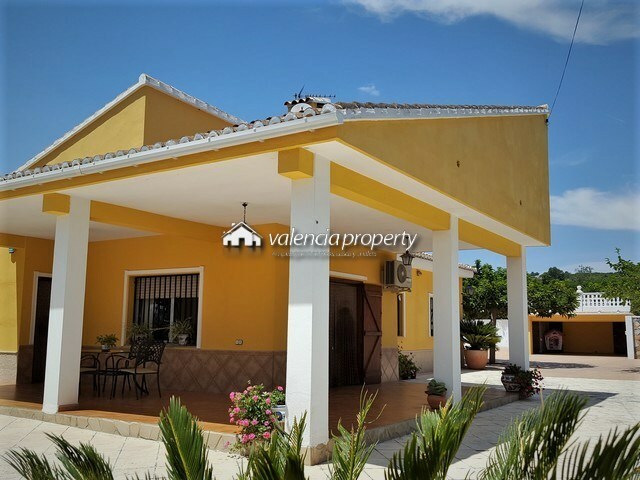 Fantastic detached villa with 4 bedrooms, garage and pool, near Xàtiva. Deligthfull Detached Villa, with a ground floor apartment + pool, 2 km from Xàtiva.